After centuries of oppression, trouble is fermenting in Ireland. As anti-English sentiment builds, trainee teacher Ellen Healy falls in love with Guy Forrister, a cadet in the British army and a proud defender of the Empire. But their love affair takes place in the shadow of war and revolution, forcing the young couple to cross political and religious divides that are becoming ever more entrenched. A passionate nationalist, Ellen’s brother Harry joins the fledgling Irish Volunteers to fight for independence. 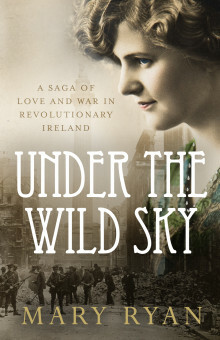 Harry’s beautiful fiancée, Deirdre, is determined to fight alongside him, but when rebellion takes hold of Dublin during Easter 1916, the brutal consequences of confronting an empire quickly become clear. Ellen, Harry and Guy are three young friends in the cross hairs of history. As war spreads through Europe and insurrection brews in Dublin, they must question the convictions that have defined their lives. Mary Ryan is the bestselling author of Whispers in the Wind, Glenallen, Into the West, Mask of the Night, Shadows from the Fire, Summer’s End, The Seduction of Mrs Caine, The Promise, The Song of the Tide and Hope. Her books have been translated into German, French, Greek, Korean and Swedish. A retired solicitor, she is based in Dublin.